John Aizlewood has worked for Pizza Hut's parent company, one of the world’s largest franchisors, for more than 20 years. He started his career with Deloitte and Touche, where he qualified as a chartered accountant. Soon after, John joined PepsiCo restaurants in finance, before moving into operations with KFC. Following that, he oversaw the central European and Russian markets for KFC and Pizza Hut, quickly followed by moves into franchise and development and operations. He rose through the ranks at Pizza Hut, and is currently their chief development officer. When did Pizza Hut first launch in the UK and how many franchises are there now across the UK and Ireland? Pizza Hut opened its first restaurant in the UK in 1973 in Islington in London. The first delivery store followed 15 years later in 1988, while the first Express unit opened in 1990. There are now 90 franchisees across the UK and Ireland. You started as an accountant then progressed through finance positions before taking on a franchise and development role – what attracted you to franchising? What attracted me to franchising was the ability to work with so many people who run their own businesses, helping and coaching them to grow their businesses, while also being able to learn from them as well. 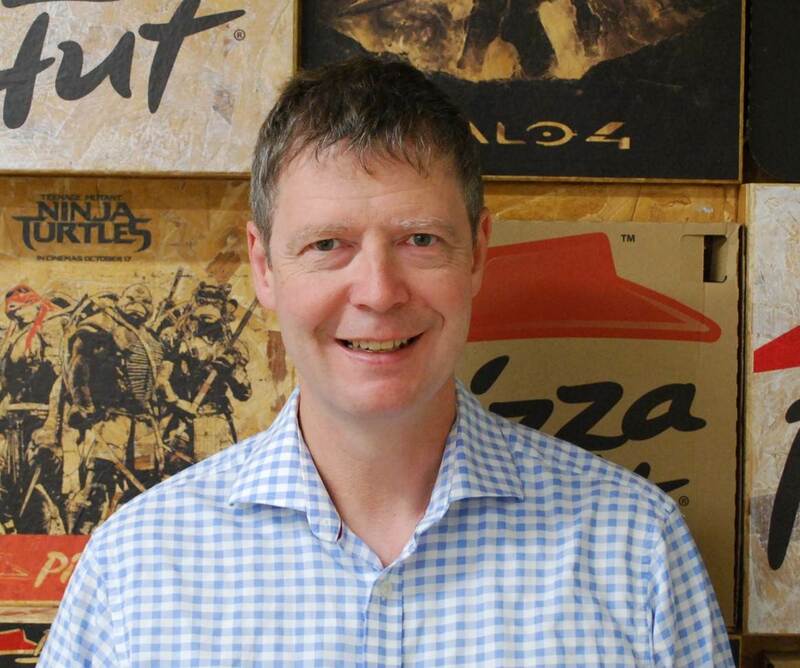 What does being Pizza Hut’s chief development officer for UK and Ireland involve? What is the most rewarding aspect of the job? The role is exciting and very diverse and can be best summed up by all the different teams that make up our business development function. These include everything from acquisitions, construction, estates and maintenance through to market planning, franchisee recruitment and legal. There are many rewarding aspects to the role. For me, the most important elements are growing and developing people along with seeing franchisees becoming successful – while at the same time also having fun doing everything we do! There are of course challenges with the role, given its diverse nature. The main obstacle that I face is ensuring that I spread my time against all aspects of the job in the most efficient way. How do you keep your franchise model different from your competitors? Our franchise model is very much focused on collaboration. This means that we are constantly involving and interacting with our franchisees so that we can learn from them and gather ideas to help drive the business forward in the best direction. What factors are key to Pizza Hut’s continuing success? I would say there are two key elements – great innovation coupled with an adherence to what the customer wants. As a keynote speaker at the British & International Franchise Exhibition – what will your speech focus on? What can potential franchisees expect? I’m going to talk about what makes a long-lasting and successful franchise. Hopefully potential franchisees will gain an insight and understanding of what I believe has made Pizza Hut such an enduring franchise. What qualities make a good Pizza Hut franchise owner? When we’re looking at potential franchisees, we look for owners who have a focus on the customer and who are also able to build a strong team while having the desire to grow their business and succeed. What advice would you give to someone thinking of starting his/her own business? My main advice would be to find a business that you know you will enjoy being part of. What can we expect from Pizza Hut in 2016? This year will see us continue to focus on new store growth and a continued focus on providing a great customer experience.